Here is the fabulous Olga Peretyatko following her acclaimed debut performance as Elvira in I Puritani at The Metropolitan Opera in New York City. 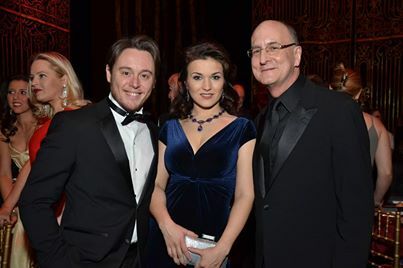 Flanked by her husband Maestro Michele Mariotti, the conductor of I Puritani and Peter Gelb, the General Manager of the Metropolitan Opera, she shines in an 1885 Siberian amethyst and diamond necklace and earrings from A La Vieille Russie. Encore! Encore!